Last Tuesday, I drove out to Landscape Ontario in Milton to participate in the judging of their Awards of Excellence, the winners of which will be announced at the upcoming October Expo for the trade. 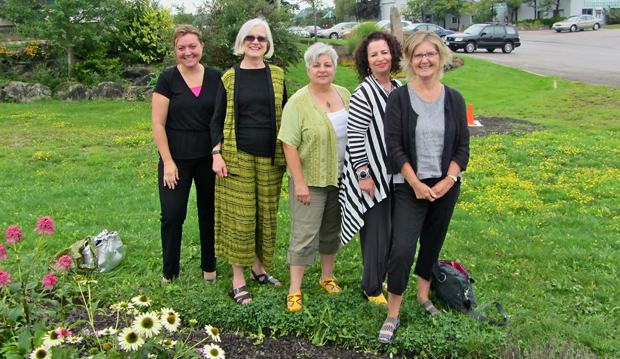 I was there to look at entries in various categories submitted by nurseries and garden centres across the province. This year, there were nearly twice as many entries as last. The reason? 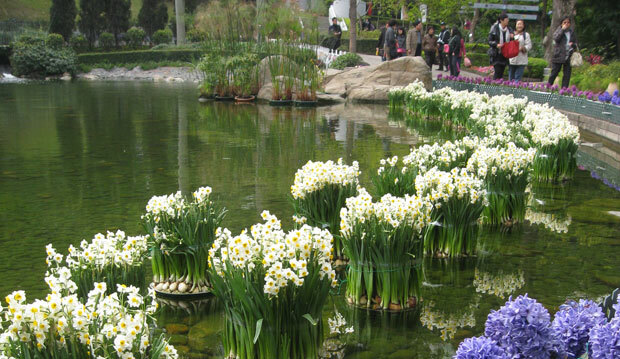 While many gardeners have moaned about the heat and the drought, the dry, warm spring was good news for Ontario’s nurseries and garden centres. How important is the weather to their business? Last year’s cold, wet start resulted in the worst sales in a quarter-century. 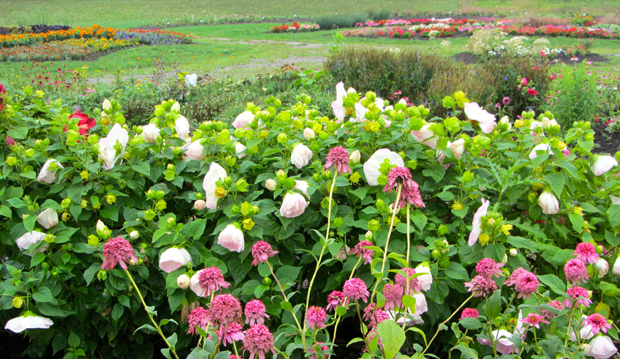 And while at Landscape Ontario, we checked out the trial beds, which, due to the heat and a problem with the irrigation system, aren’t as lush as last year’s, with shorter, less floriferous plants. And is it just me, or have you noticed that the squirrels seem smaller and leaner this summer, too? Speaking of wild animals, I hired Norm the Trapper to sort out the raccoons living in the wooden ceiling of my garage. Here’s what happened. 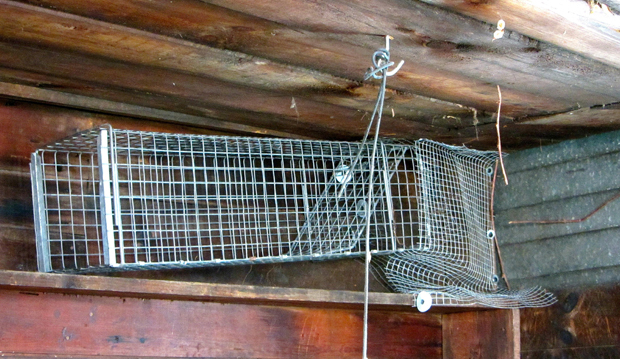 So Norm erected the contraption you see above (his “best trap”), which allows the raccoons to get out but not back in. Yikes. For a few days, the bricks were moved. Lately, they’ve stayed put and nothing untoward has happened. Norm is coming back in a couple of weeks to remove the trap and shore up a few places where the raccoons might be able to get in. And hopefully, that will be that. Last week, the TBG participated at the Urban Agriculture Summit at Ryerson University. 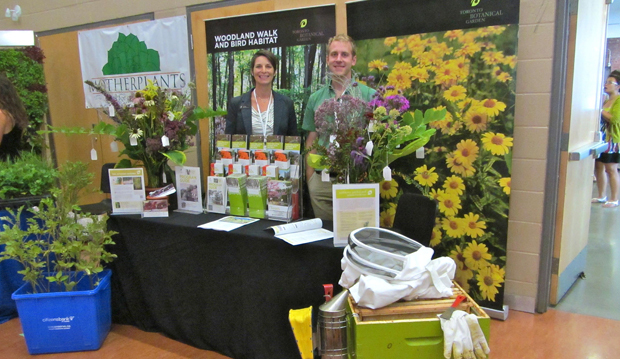 Here, Director of Education Liz Hood and Assistant Stefan Weber stand in our booth—the nicest looking one there (the flowers come from our gardens, and were arranged by Head Gardener Sandra Pella). Sandra and I took over in the afternoon, and made interesting connections with delegates from as far away as Mexico and Australia. 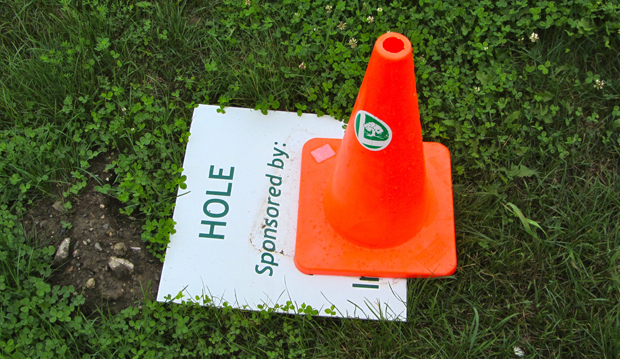 We love to get out and spread the good word about the TBG. And speaking of “good word,” you can look for us on Sunday, September 23 at Word on the Street. Sadly, our concert season ends this Thursday, so catch the Sarv Ensemble at 7 p.m. Despite some iffy weather, we’ve heard marvelous music with free admission for all, made possible by the generous support of the Edwards Charitable Foundation. Here are a couple of photos from the last two concerts. 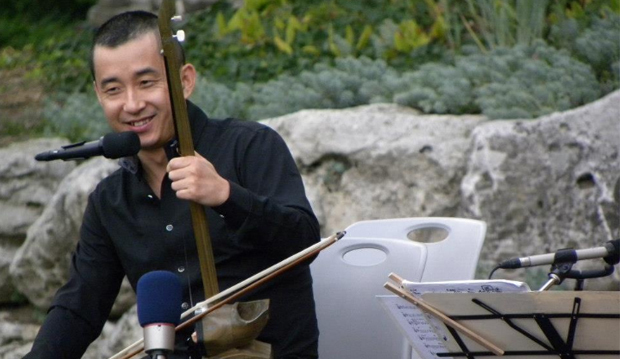 Last week after the “Taste of the Garden: China” event, I’m told that Chinese musican George Gao gave an absolutely mesmerizing performance. Unfortunately, I was holding down the fort at the Urban Agriculture summit and couldn’t get back in time. 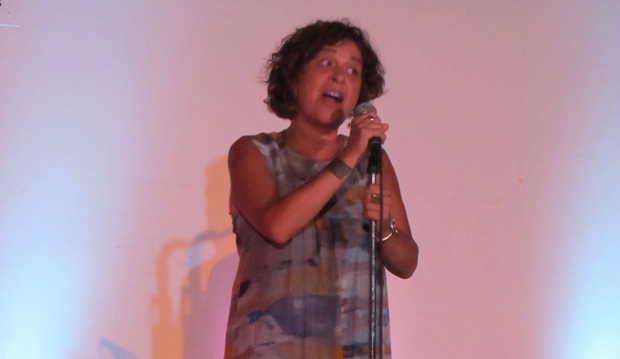 The previous week, singer Laura Hubert and her excellent backup duo (keyboards and saxophone) entertained us with a medley of delightful, seldom heard vintage jazz and blues standards. Now that concert I did see, and it was terrific. 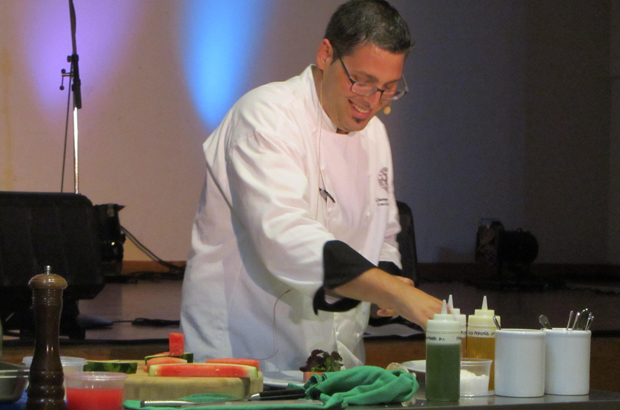 Before Laura’s performance, Assistant Chef George Caracitsos of the St. George’s Golf and Country Club gave us some great ideas for summer fare, featuring produce from our weekly Organic Farmers’ Market. He even showed us how to filet a fish. This week, it’s Evelyn Gharibian of Hearty Catering, marking the last of the chef’s series for the season. See her demo at 6:30 p.m., right before the concert. And you can grab a light, inexpensive bite at our Garden Café. Next week, the café goes back to its regular hours of 10 a.m. to 4 p.m., seven days a week. Please note, however, that our weekly Organic Farmers’ Market will continue to bring you farm-fresh produce, cheese, baked goods, meats and more every Thursday from 3 to 7 p.m. to October 4. 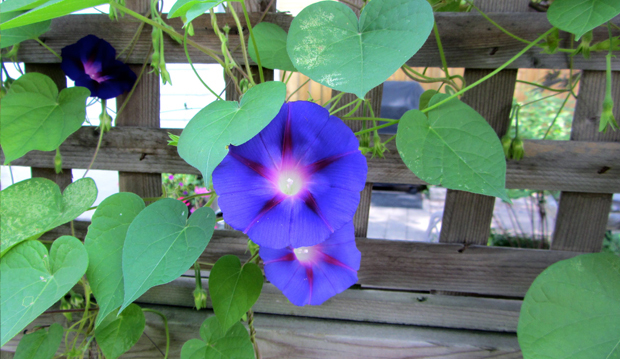 I love the vibrant colours of these morning glories that grow through the gravel in my driveway and scramble up the fence. 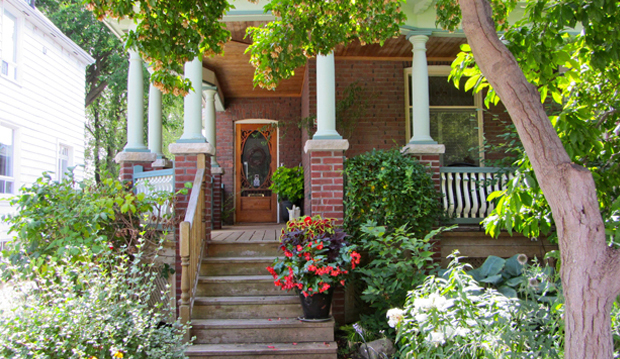 And here’s the walk up to my front porch, where I like to sit, have a drink and do some summer reading. 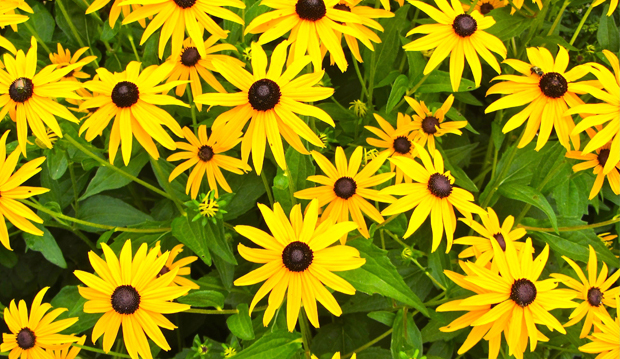 For a while, I turned up my nose at black-eyed Susans. I was experimenting with a specific colour palette and they didn’t fit in—too raucous, snooty snoot snoot. Happily, my garden had other ideas. It is now a madwoman’s breakfast of colour and not in the least bit tasteful. 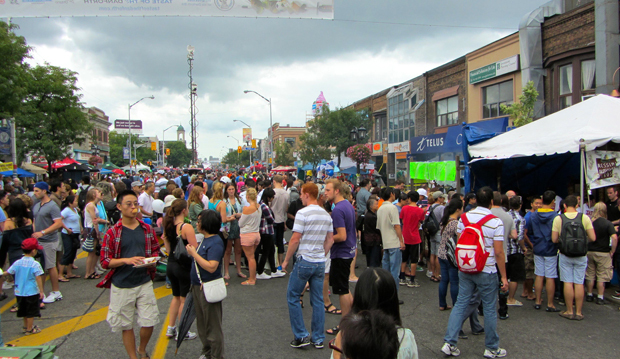 Speaking of taste, taken in small doses, the annual scrum called Taste of the Danforth is fun. That’s because I can just walk up the street, dip my toe in and grab some souvlaki and corn, then beetle home to enjoy them on my front porch. Bliss. And I hope life has been delicious for you as well. Don’t let the long-faced doomsayers convince you that “summer is over.” There’s plenty of good stuff left. I’ll see you back here in a couple of weeks. 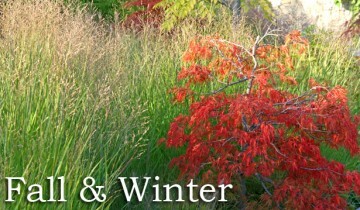 Enjoy a fall and winter photography tour of the Toronto Botanical Garden. All images Copyright Janet Davis 2008-2012.